Note: For this page I assume a passenger train of Zugart (train type) "O". For other train types, the speeds, times and lengths differ. I assume no regular halt between the distant and main signal. 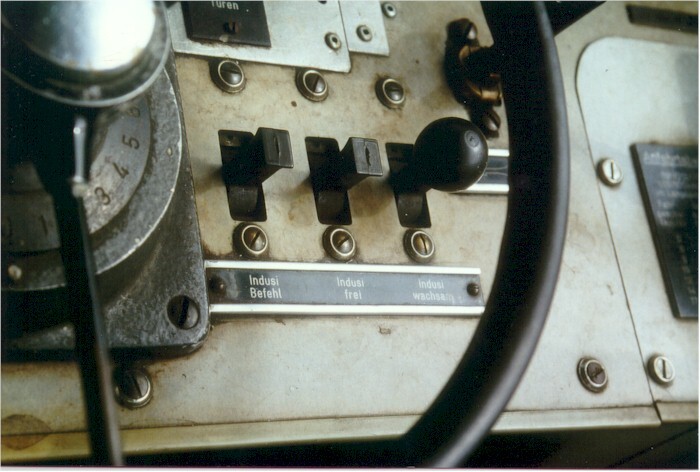 The status of the Indusi is indicated by an array of lights (see the Cab displays page). The 85 km/h indicator tells us that the Indusi is active and that the train type is set to "O". Since no frequency indicator is lit, the Indusi currently does not monitor our speed. On passing the 1000 Hz magnet, we acknowledge the detection of that magnet within four seconds ("Indusi Wachsam" button, see picture). The steady yellow light comes on after we release the acknowledgement button, and reminds us that a 1000 Hz-induced speed limit is active, and no release from the speed limit is possible at this time. Now we have 23 seconds to reduce our speed to 85 km/h. The flashing blue "85" light reminds us to do so. After 700 m, the yellow light turns off, so we could release ourselves from the speed limit. Unless we do so, the speed limit is still active, as shown by the flashing "85". Since we assume that the main signal is still at halt and we don't want to be fired, we further reduce speed. If the signal had changed to clear, we could release the speed limit. Next, the 500 Hz magnet is detected. The speed must not exceed 65 km/h at this point. Within the next 153 m, we have to reduce our speed to 45 km/h and must not exceed that until we reach the main signal, where we will come to a halt. As soon as we halt, or travel with 10 km/h or less for at least 15 s, the 500 Hz-induced speed limit is further restricted to 25 km/h, which is indicated by the 70 and 85 lights alternately flashing. We stop at the main signal. The signal then changes to clear. Since the 500 Hz-induced restrictive speed limit (i.e. 25 km/h) is still active, we accelerate but not faster than this speed. When we have travelled for 200 m or 250 m after the halt, the 500 Hz restrictive speed limit ends, so the 500 Hz light goes out. Since the 1000 Hz-induced speed limit is still active until 1250 m after the 1000 Hz magnet (i.e. until about 250 m after the main signal), and is restrictive because we had halted, we could not go faster than 45 km/h, indicated by the alternately flashing blue light. Since the main signal is clear, we can now release ourselves from the speed limit, which we do by pressing the "Indusi Frei" button. The Indusi will keep looking for a 500 Hz magnet until 1250 m after the 1000 Hz magnet, then it will return to its normal state. If the signal changes to clear before we detect the 500 Hz magnet, we can release ourselves from the speed limit (Indusi Frei ) and accelerate to line speed. If we had wrongly released while the signal was still at red, the detection of the 500 Hz magnet would have caused an emergency braking. Suppose there is a regular halt between the distant and the main signal, before the 500 Hz magnet. If the signal turns to clear, we depart and release ourselves from the (restrictive) speed limit (45 km/h). If the halt was after the 500 Hz magnet, after departure we would have to obey the restrictive 500 Hz-speed limit (25 km/h) for 200 or 250 m, then release ourselves from the (restrictive) 1000 Hz-speed limit. Suppose we have a station with a main track (upper track on the image) and a goods siding. A passenger train (shown in light green) enters the station on the main track and stops at its regular halt between the 500 Hz magnet and the exit signal. (The H board was omitted on the drawing). While the train enters the station, the points on the main track are set to straight, and the points on the goods track are also set straight as flank protection. So after the exit signal we have a sufficient safety overlap should the passenger train overrun the exit signal. Now, the points are set for the goods train to exit. Since the route for the passenger train has been reset, there is no overlap after main track's exit signal. If in this situation the passenger train would start against the exit signal at danger, it might have gained sufficient speed at the exit signal that it could endanger the goods train. To avoid this danger, the speed limit for the halting train is lowered sufficiently. Now, suppose we come across a red or failed signal, and we got the permission to pass that signal (by the post plate, or by the signalman). How do we pass the 2000 Hz magnet without rocking ourselves and the passengers? Well, we press the "Indusi Befehl (40)" (Indusi Order [40 km/h]) button. The "Befehl 40" light will go on, every magnet will be ignored, but we must not become faster than 40 km/h, until we restore normal operation of the Indusi, which we must not do until we pass a main signal at clear.